Winser London delivers to addresses in the UK,Aland Islands, Albania, Andorra, Australia, Austria, Bahamas, Barbados, Belgium, Bermuda, Bosnia and Herzegovina, British Virgin Islands, Bulgaria, Canada, Cayman Islands, China, Croatia, Cyprus, Czech Republic, Denmark, Estonia, Faroe Islands, Finland, France, Germany, Gibraltar, Greece, Greenland, Guernsey, Hong Kong, Special Administrative Region of China, Hungary, Iceland, India, Ireland, Isle of Man, Israel, Italy, Jamaica, Japan, Jersey, Jordan, Republic of Korea, Kuwait, Latvia, Lebanon, Liechtenstein, Lithuania, Luxembourg, Macao, Macedonia, Republic of Malaysia, Maldives, Malta, Mauritius, Moldova, Monaco, Montenegro, Netherlands, New Zealand, Norway, Poland, Portugal, Qatar, Romania, Saint Kitts and Nevis, Saint Lucia, Saint Vincent and Grenadines, Saint-Martin (French part). San Marino, Saudi Arabia, Serbia, Seychelles, Singapore, Slovakia, Slovenia, South Africa, Spain, Sri Lanka, Sweden, Switzerland, Taiwan, Republic of China, Thailand, Trinidad and Tobago, Turkey, Turks and Caicos Islands, United Arab Emirates, United States of America. We will endeavour to deliver all goods within the time specified below but accept no liability for any late delivery. • Payment has been approved. • The delivery/billing address has been verified. In calculating when your order will arrive, start from the day you placed your order and count only business days thereafter. Prices quoted on the website include VAT as applicable. At the point of purchase, VAT will be deducted from the sub-total if the delivery address is outside the EU. Products delivered to destinations outside the EU may be subject to import taxes, fees, levies or other charges which are the sole responsibility of the purchaser, or the recipient of the purchase if different. Be aware that this may delay your delivery time, as it will be your responsibility to pay the necessary charges for local authorities to release the products from Customs. You may wish to contact the relevant Customs authorities for clarification before placing an order. 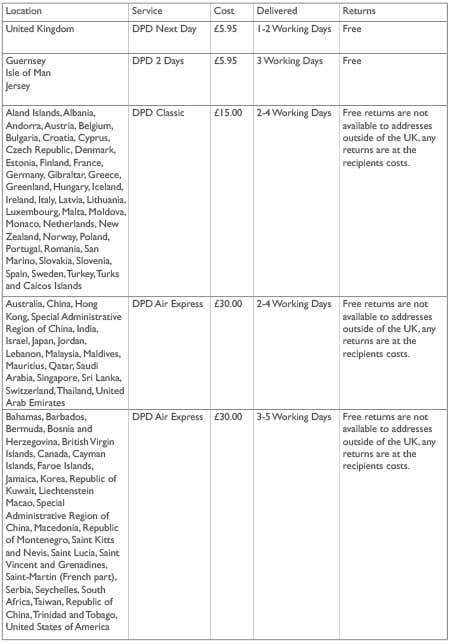 Orders are sent by DPD AIR Express, once you have received a despatch confirmation email, you will receive a tracking number that will allow you to track your order from despatch to your doorstep. Delivery lead times are 2 to 4 working days. If you have any questions regarding your order, please do not hesitate to contact our Customer Service team (Monday – Friday, 9am – 5pm Excluding Bank Holidays).